Our Self-Service solutions are industry leading in the variety of devices offered and the integrated functionality we enable. 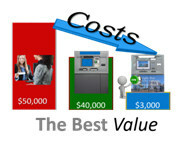 We offer devices from economical cash dispensers that extend market presence at little to no cost to the latest in deposit automation technology. Our approach is based on the notion that it is not about the box anymore it is about what it can deliver, keeps us focused on getting the most out of any delivery device. Our integration ensures that we deliver a seamless consumer service experience and improve branch efficiency with transformations no matter which solution they decide to visit. Our technology ensures that we can maintain superior availability and integrate new solutions without the need and cost of site visits to each device. Our technology is the key to delivering the latest self-service transaction delivery. We enable to simplest of cash delivery devices to become marketing machines improving the financial institutions brand awareness and market availability. Our advanced deposit automation technology allows for simple consolidation and industry leading validation. Our central server control and wireless flexibility gives us the ability to provide industry leading reliability. Our Know before you go diagnostics brings maintenance to a new level of response and remedy times. Our software management ensures that the latest PCI required security patches are delivered and our remote marketing makes delivering time sensitive messages easy. Our value begins with the greatly reduced cost of transactions delivery as compared to traditional Branch and Teller methods. Our integration eliminates the upfront cost of product development and ongoing maintenance that requires expensive site visits. We deliver on a monthly transaction deliver model offset by 100% of Transactional revenue. Our self-service technology development focuses beyond the devices and solutions currently available. Self Service platform transaction kiosks for opening new accounts. The latest check validation for to enable self-service check cashing and the latest video technology for security.